I reviewed this book in 2014. Suzi and I have a passion for comfort food and that continues. Today, we are in Utah eating tacos and burritos and … Comfort food. This book that plenty of comfort for you. Plenty. This is the time of year when we often talk about feasts, holiday feasts. But, not every day is a holiday. Or can be. Nor would we want it to be. You can get “fooded” out this time of year. Yet, after a day or two of soup and salad — perhaps an early New Year’s Resolution? — we return to wanting a good, comforting meal. Comfort foods are those recipes we make at home that make us think of home, feel of home, feel part of that warm kitchen. 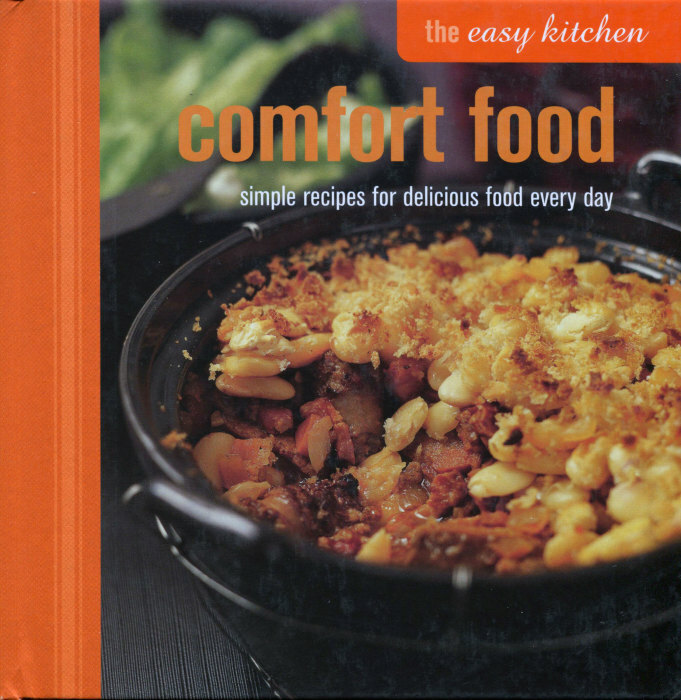 The staff at Ryland Peters & Small have just the book for you, one appropriately titled Comfort Food. It’s filled with dishes you can make at home, on weekends or weeknights. Most of the recipes are simple to assemble and can be left to simmer or roast while you tend to the immediate chores of the hour: some snow to deal, homework to prod and help on, or just a glass of wine that needs care and feeding. Well, care and drinking actually. Comfort Food has some of the standard fare you would expect and actually need: mac ‘n’ cheese, for example. But this tidy, tasty book has recipes from around the globe: India, Morocco, Mexico, and Southeast Asia. You are sure to raise your comfort level by browsing through and then cooking from Comfort Food. You know, some of these dishes do sound like feasts, don’t they? That last one, the pork belly with apple and fennel could adorn any holiday table with grace. But, of all these, I must say I’m first attracted to the Mashed Potato Pie with Bacon and Leek and Cheese. These recipe ideas are for your consideration and consideration is surely the word to use. These are considered recipes, well developed and designed to provide just what the book title says: comfort food. A good comfort dish has to have something extra, something special, perhaps something extra special. It has to, from the first bite, make you aware and begin that addictive process that will have you return again and again to this recipe. Comfort Food is filled with those ideas. Time to fill your tummy.